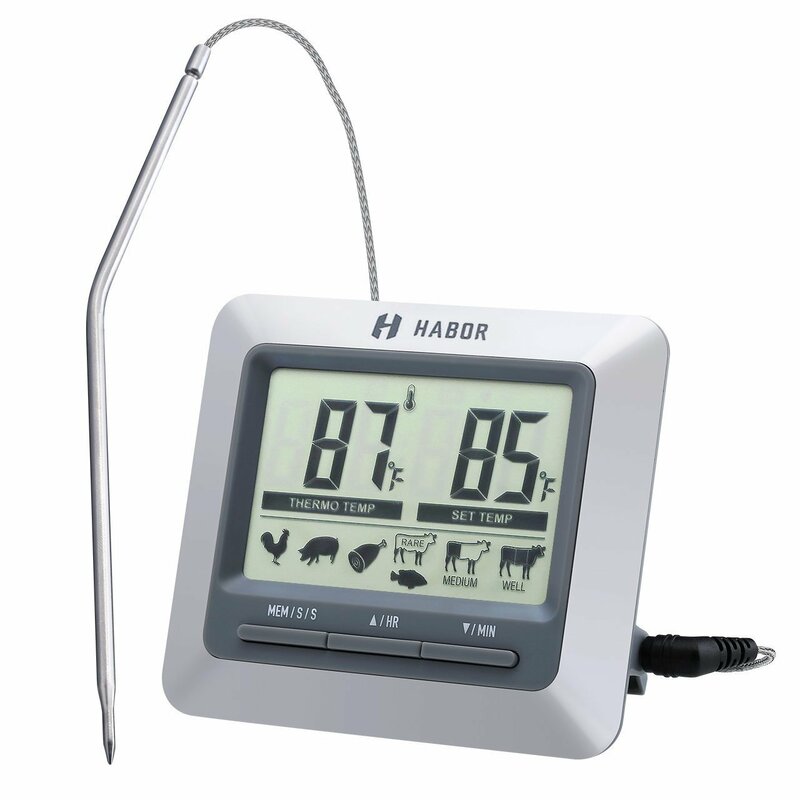 PROFESSIONAL CUISINE THERMOMETER: Featured pre-programmed and customizable manual temperature setting, Habor grill meat thermometer offers different meat selections and allows you to choose from Rare, Medium or Well which frees you to guess or look up the correct temperature. It’s perfect for barbecue, oven or stovetop. 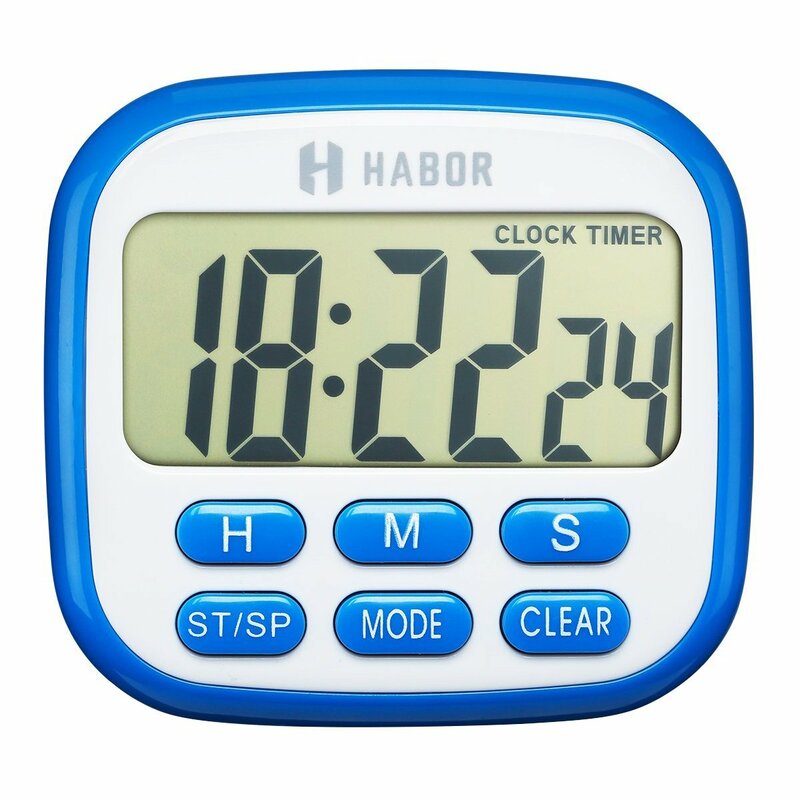 TIMER MODE: Under timer mode, this accurate timer can count down in a range from 1 minute to 24 hours which making it a perfect timer for VARIOUS ACTIVITIES like homework, taking drugs, barbecue, gym, workout, cooking, baking, sports, competitions and meetings. LONG TESTING PROBE: With 6.5 inches 304 food grade stainless steel probe and 40 inches stainless steel mesh cable, it offers remotely monitor to your rack of lamb or prime rib and won’t get splashed by oil. LOUD BEEPING ALERT: 60 seconds count down with 85DB loud beeping alert at timer mode to ensure your barbecue will not scorched again. While at thermometer mode it will keep beeping when the meat temperature is higher than setting temperature. TESTING RANGE: Both Fahrenheit degree and Celsius degree are available. Temperature test range is between 32°F to 482°F (0°C to 250°C). Temperature testing is accurate to ±1.8°F(±1°C). 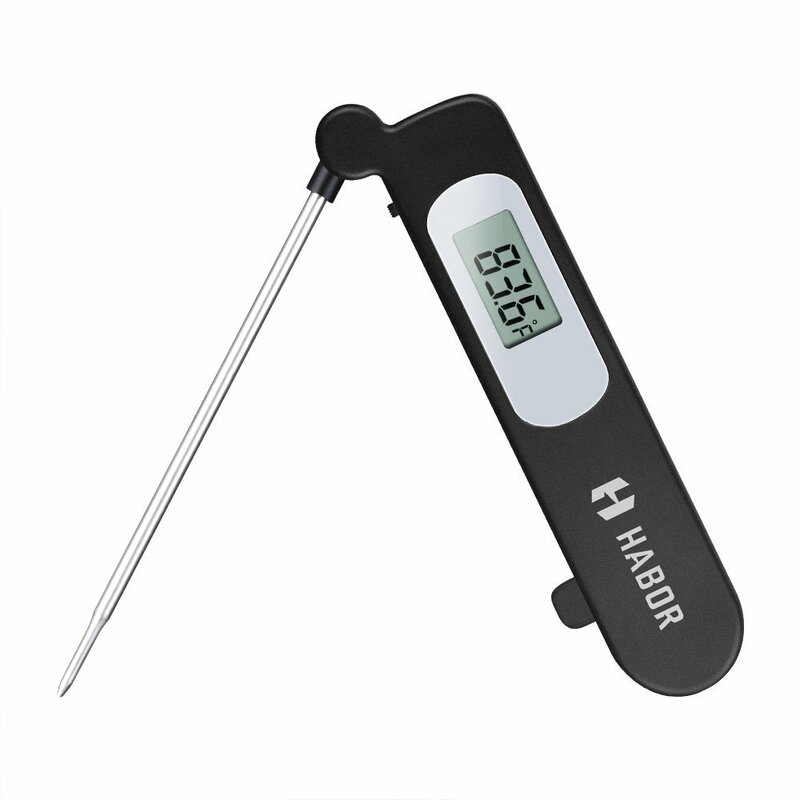 【Super Fast Instant Read】 Habor meat thermometers will get food temperature out in 4-6 seconds. From now on, no overcook again and no waiting! 【Longer and Foldable Probe】 4.8 inches longer sensitive probe, make sure never burn your fingers! Foldable probe is also a great design for storage in your pocket, apron, drawer. When no need, please clean the probe with wet cloth after using. 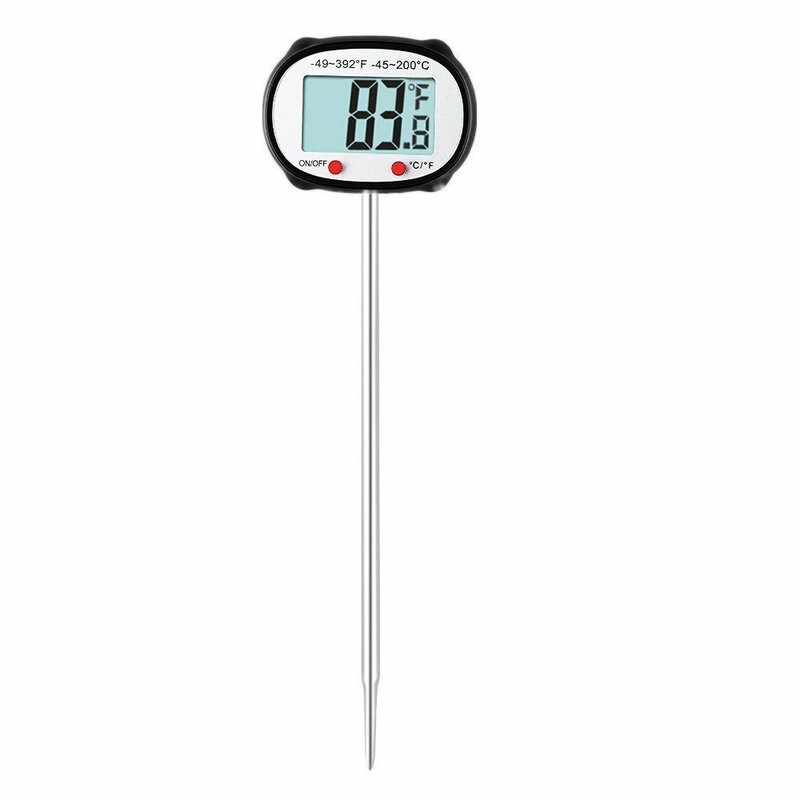 【More Accurate Readout】 Habor Digital Kitchen Thermometers has Sensitive Sensor Chip and Thin Probe Tip, which control error range ±1.8ºF. This is a very excellent performance! 【Easy to Use】 Choose F/C display inside the thermometer backcover first. Turn on the thermometer with On/Off button. 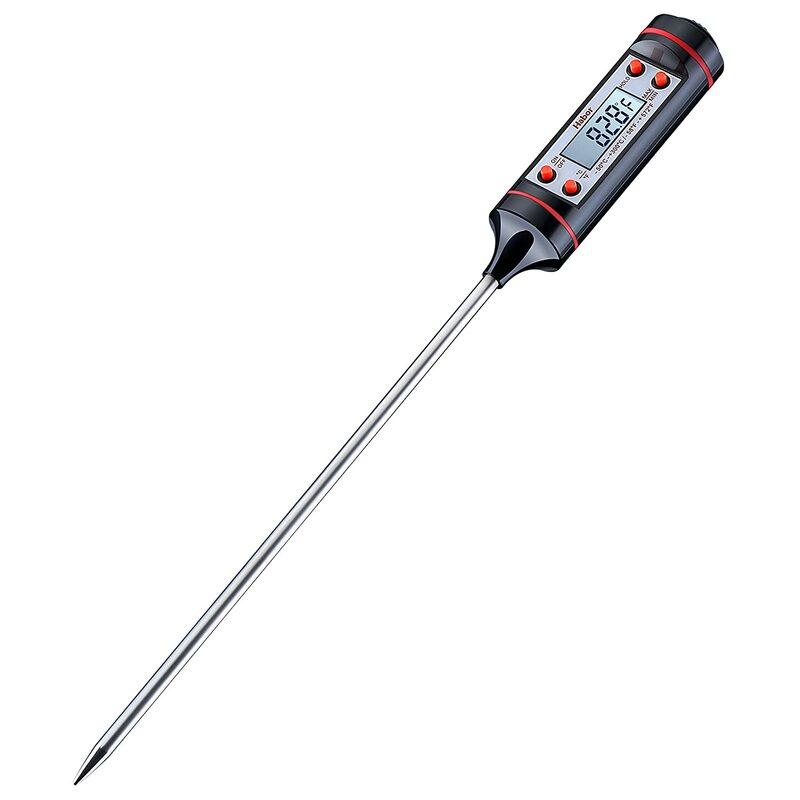 Stick probe into meat or food and wait about 4-6 seconds, then read the temperature out from the digital LCD display. When used up, turn it off. This elegant and versatile meat thermometer enables you to prepare perfect meals without slicing your food. Simply insert the long temperature probe into your food / liquid and get perfectly cooked food every single time. It can be used for meat, candy, baking, barbecue as well as bath water. 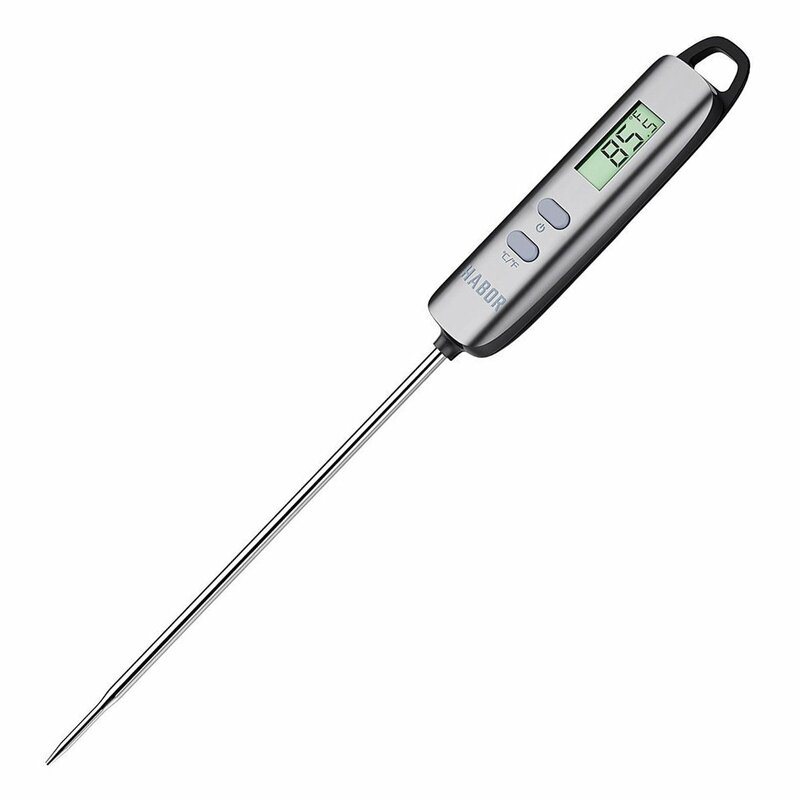 This digital meat thermometer will give you accurate readings in both Fahrenheit & Celsius on it’s digital LCD display. It has an 5s instant response time thanks to its high precision temperature sensor, ensures you can grill steaks to your perfect doneness knowing it wont be under cooked or burnt. This top-of-the-line cooking gadget has a 4.8″ stainless steel probe that extends to a total length of 10.3″, thus keeping your hands away from the heat when cooking at the grill . Convenient foldable probe design folds away easily and locks into base when not in use for portability and storage. The Habor meat thermometer probe is stainless so you can clean the probe with a damp cloth after use, but DON’T submerse the cooking thermometer into the water or place it in dishwater. Because it is not waterproof. Push the F/C button (located inside the battery compartment) to select the desired temperature unit. 1.Clean the thermometer and probe with a damp cloth before and after use. 2.Do not submerse the unit in water or place it in dishwater. 3.NEVER use the thermometer in a closed oven. 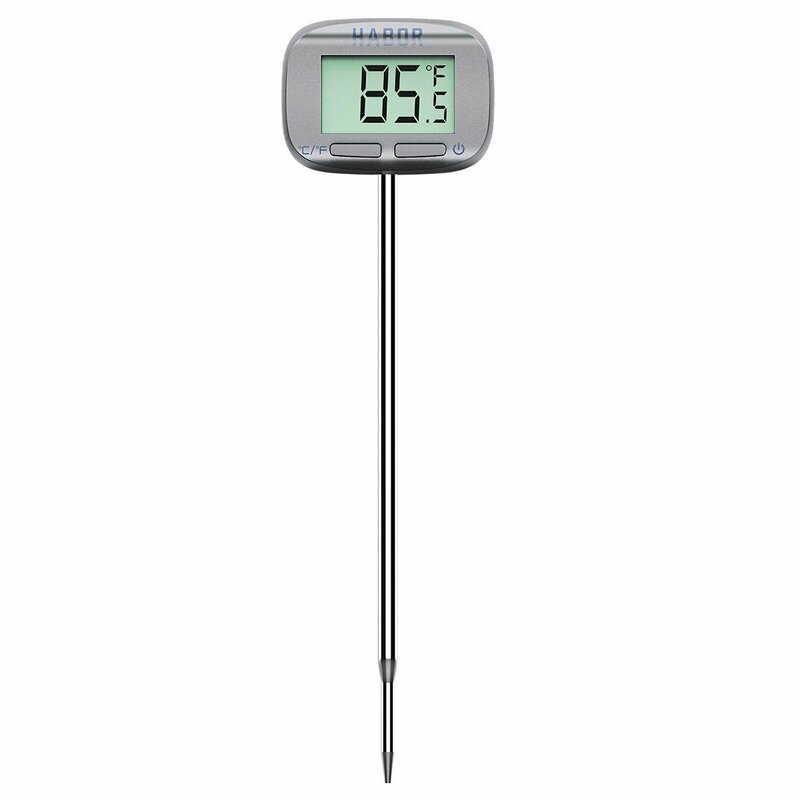 Every Habor food thermometer includes 45-day money back and 18-month warranty. Flawlessly Accurate and Quickly Instant Read: Get the Temperature Readout in 5 Seconds with High Precision Temperature Sensor. This Habor Meat Thermometer Reads Several Times Faster than the Old Version. Super Large LCD Digital Screen Display: This Thermometer Offers Large Enough LCD Screen for Reading Easily without Having to Bend Down Close. Portable Protective Pocket Sleeve for Probe: With Handy Protective Pen-Like Probe Sleeve, Chef can Hang the Thermometer on the Pocket/Jacket/Apron/Pant. Also can protect the 4.8 inch Long Probe in Drawer. 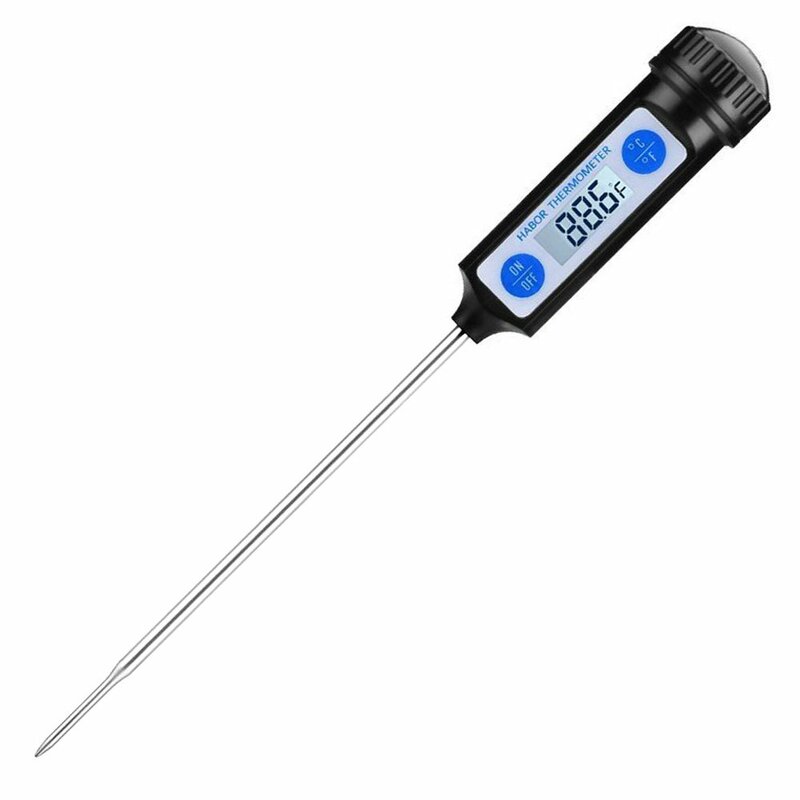 Easy to Use Thermometer with Large Temperature Range from -49ºF to 392ºF (-45ºC to 200ºC) for Smoke Meat, Grill, BBQ, Candy. Auto Shut-Off after 15 Minutes for Saving Button Battery. Meanwhile, PLEASE Not to Sink it into the Water and Clean with A Damp Cloth. RAPID&PRECISE READ: The habor cooking meat thermometer will instantly display precise temperature readings for foods and liquids in few seconds. Say goodbye to boring wait and repeated measure! SENSITIVE PROBE: Unlike other food thermometers, the tip of probe is designed to much thinner, contributing to faster heat transfer rate. 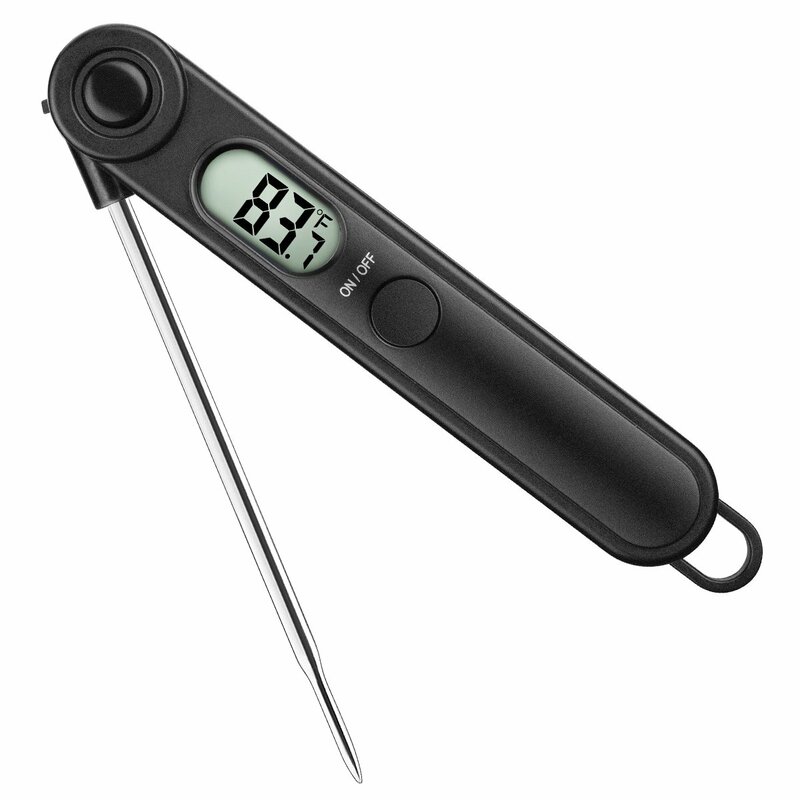 Comes with 4.8 inches long probe, the habor meat thermometer is easy to use and will protect you from burning dangers. AUTOMATIC SHUTDOWN: The digital meat thermometer comes with a 10-minute automatic shutoff feature, which will keep your food&meat thermometer’s battery from getting used up. HEALTHFUL AND SAFE GUARANTY: Designed with 304 stainless steel, the digital meat thermometer maintains fine physical properties even under ultra-high temperature. With the protection by a silicone cap, it is portable for anywhere use and handy storage.